While national and international emergency team fly and swim against time to rescue about 350,000 Mozambicans still under siege for the fifth consecutive day in the districts of Buzi, Chibabava, Nhamatanda and Dondo, in Beira corpses accumulate in the mortuary because funerals are impossible. "People no longer take the bodies to the mortuary, they keep them at home," Assembly Deputy Juliano Picardo said as he walked the route between Nhamatanda district and the capital of Sofala province. Picardo, who lives in the city of Beira, revealed that: "People no longer take the bodies to the mortuary. Everything is under water and cannot do funerals. We are keeping the bodies in places that we do not have water. It is a scene of great sadness." The deputy, who worked in the city of Chimoio over the past week, is political adviser to the Renamo party, and on Sunday (March 17), given the lack of communication with his family that lives in Matacuane neighborhood, drove off to the city of Beira with Francisco Maingue and Herminio Morais but had to abandon his vehicle shortly after the toll at Nhamatanda. "We crossed the toll and the first bridge there was a shortfall of about 1000 meters," Picardo said. The deputy and his travelling companions then crossed the hole in the brand new National Road #6 in a rowing boat owned by a British farmer who provided two workers. The boat has also been carrying many people across as "the authorities there are missing". On the other bank there was no means of transport and the solution was to walk the 100 kilometers to Beira. The water was "at the knees", Picardo said, adding that he "helped people in trees at risk of my own life. Imagine what it's like to, with my own hands, to have to carry six cadavers and place them along the National Road No. 6." "I saw cars with people still inside, but the helicopter was still spinning above us and the information that has reached us is that it was the president looking at the flooding situation in Lamego area. Unfortunately the helicopter did not lower, probably had taken that vehicle may could take the bodies were still inside." 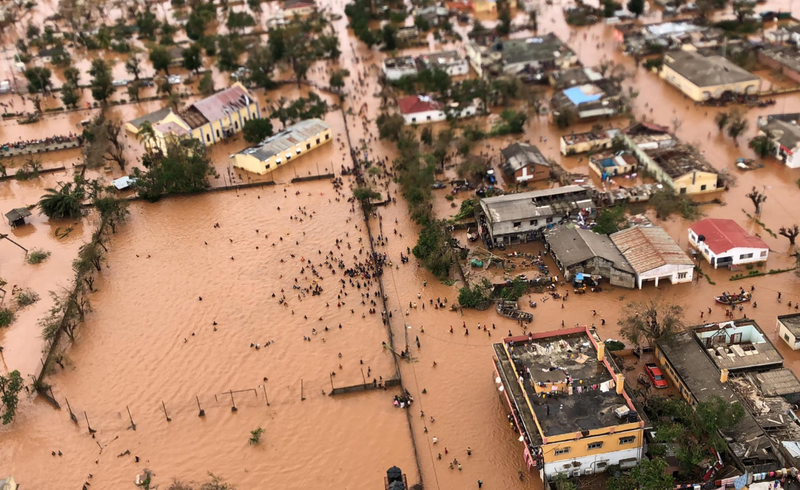 He made an appeal to the government and humanitarian institutions to use its resources, the few that there are, to stop flying to take photographs and use it to help Mozambican citizens. Picardo also denounced opportunistic business people who have inflated the price of candles, public transport and food, saying: "Our entrepreneurs have to act in solidarity during this time of calamity." As if to illustrate his point, starving citizens tried to take food from a warehouse on March 20 in Matacuane neighborhood. Police intervened by firing live ammunition, to which the people responded by throwing stones. The situation calmed and there were no injuries.